Dr Frank Tong Fuk-Kay is the Global Head of Innovation and Strategic Investments of The Hongkong and Shanghai Banking Corporation Limited (HSBC). He is based in Hong Kong, taking over responsibilities for the Applied Innovation and Strategic Investment teams. Before joining HSBC, Dr Tong was the CEO of Hong Kong Applied Science and Technology Research Institute (ASTRI), the largest government funded R&D organization under the Innovation and Technology Commission. He led the institute with core strategic technology areas in Financial Technologies, Intelligent Manufacturing, Next Generation Network, Health Technologies, Smart City and IC design. Under his leadership, ASTRI has successfully commercialised many technologies, and collaborated with many local, regional and international academic and commercial organisations. In addition to initiating a number of Joint Labs and R&D Centres, Dr Tong has also spearheaded talent development and capacity building endeavours for students and professionals alike from Hong Kong, Mainland and elsewhere. Collaborations with public sector organisations in Hong Kong and overseas like Hong Kong Monetary Authority, Bank of Thailand, and Electronic Transactions Development Agency of Thailand, and partnerships with leading banks such as Bank of China (Hong Kong), ICBC, and HSBC have thrived during his tenure. After a rich and successful career stint in the US in IBM Research, he returned to Hong Kong to teach at the Chinese University of Hong Kong (CUHK). Between 2001 to 2004, he was seconded from CUHK to ASTRI as Vice President of the Photonics Group where he successfully led the group's spin-off and joined SAE Magnetics - a wholly owned subsidiary of TDK. The spin-off was one of the most successful commercialisation endeavours in the history of ASTRI. From 2013 to 2014, he was the CTO of Hisense Broadband Multimedia Technologies, leading successful mergers and acquisition of a technology company in US. 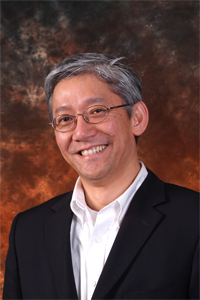 Frank was born in Hong Kong and had his primary and secondary education at La Salle College. He obtained BA and MA degrees respectively from UC San Diego and UC Santa Barbara, and PhM and PhD from Columbia University while conducted his thesis research at MIT Lincoln Labs. He was credited with close to 200 research articles, and 19 patents. Frank is very active in community service, serving various advisory roles in including charity foundation, universities, scholarship schemes, and other government bureaus and departments.